One of the toughest things about a Promise program is that — in the end — the funders and the program administrators have little control on the return on the investment. Promise folks can identify, celebrate, monitor, support, counsel, engage, mentor and advocate for the scholars, but it is the business community that controls the hiring. And without certainty of that, it is hard to fully grasp the ability of a Promise program to assist in the “economic development” mission that most programs champion. 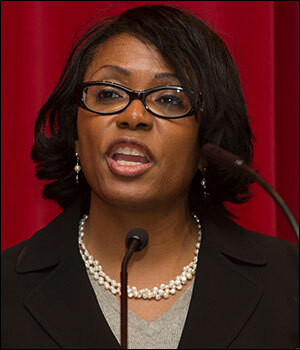 New Haven Promise Executive Director Patricia Melton — whose program will graduate its first cohort later this spring — is trying to remove the uncertainty of that. On Thursday evening at Yale University’s Payne Whitney Gym, more than 100 Promise Scholars are expected show up in natty attire, carrying several copies of updated resumes, to meet with more than 20 hiring managers from Yale University and the City of New Haven. In the first year of the program, 23 students secured summer positions, mostly on campus, from information technology to the music school, from the Yale Art Gallery to the Peabody Museum. Those Scholars also attended the Promising Leaders Program, which was developed by graduate students at the Yale School of Management and held in Yale’s SOM amazing new home. This year, more off-campus New Haven businesses and organizations have earmarked additional summer opportunities for the increasing number of Promise Scholars. Studies have found that those who successfully complete professional internships are considerably more likely to land full-time positions directly out of college. For many, it is the first opportunity to build a network within their chosen field and develop mentors who can guide them through the essential business skills which aren’t necessarily available from coursework. For the Promise would be hollow without them.